As a graduate student, annotation supervisor, and computer geek, I’m sitting in front of a screen for most of my average day, and aside from investing in a comfortable desk chair several years ago, I never really put mind to how my body was positioned, used, and stressed as I did so. This hasn’t been a problem in the past, but recently, after one acute injury (and, as I get older), I found myself plummeting into the depths of RSI (“repetitive stress injury”) hell. My wrists were killing me, fingers were going numb, my neck and shoulders were tense, and it got to the point where after about 20 minutes of typing at my desk, I would literally have to stop. Even using a wrist brace wasn’t helping, and it was getting worse, not better. Given that I write papers, code, and emails for a living, if I couldn’t safely do so, my very livelihood was at risk. I had to do something. According to the Oxford English Dictionary, the earliest attested usage of the term ergonomics was in 1949, and interestingly, the term seems to have been formed based on the existing word “economics”, simply substituting eco- for “ergo-“, the Greek word for ‘work’. Simply put though, the field of ergonomics is focused on studying how it is that people do work, and how to more efficiently and safely allow that to happen. When I started experiencing this pain, I went to see my doctor, who recommended I start looking into ergonomics. So I did. After reading some online resources on computer Ergonomics (as well as talking to ergonomics geeks), my problems quickly became clear. So, I decided to do an ergonomic overhaul of my workspace. I’m going to make a few posts discussing some of the solutions that I’ve found in that process, and reviewing the projects that have really made a difference. I quickly realized that my biggest issue was that the desk I was using simply didn’t fit me. Based on my body geometry (and my strangely long upper arms), when sitting, I need a desk that’s around 26” high. I was limping along using a 30” desk with a keyboard tray, which lowered the keyboard down a little bit, but this left my mouse on the desktop, and left my wrist at an unhealthy angle when mousing. My monitor was also far too low, and the relatively small desktop didn’t give me a place to more stably raise it up. On top of all that, I realized that I was spending way too much time sitting, and wasn’t changing my position nearly often enough to allow my body to stay healthy. So, in the name of experimentation, I built a $22 IKEA standing desk. It allowed me to pick the proper height for my body geometry (which I then knew for later) and felt great, but ultimately, as I typed, the desk-on-a-desk shook around more than I was comfortable with, and it was quite a production to move back to sitting. Perhaps most importantly, it was ugly as sin. But it was still $22 well spent. Having built and used one, I knew I could use a standing desk, that I liked the idea, and most importantly, how high I needed it to be. So, I started searching for an adjustable height desk. Unfortunately, the few stores selling adjustable height desks in my area wanted $1500+ and had non-existent return policies, so I looked online and found GeekDesk. After reading an absurd number of reviews, almost all positive, I ordered a small frame-only GeekDesk Max, to save money (shipping the top was pricy) and get a faster ship time. It cost around $810 to get it to my doorstep, and I was amazed at their shipping speed, I ordered on a Sunday afternoon and got it on Friday. I picked up a desktop from IKEA, around $38, a LACK shelf ($14), and four 4x4x5 chunks of scrap wood from Home Depot ($0.98), and assembled the whole thing in about an hour and a half. I mounted the desktop to the desk itself, put the shelf on the four blocks, and put my monitor and laptop on the shelf. I also mounted a vented plastic bin to the bottom of the table with a power strip and USB hubs, for cable management. Now my monitor’s at the proper height, my desk can be at whatever height I need, and the whole thing actually even looks attractive. In short, even costing almost as much as a month of rent, I absolutely love the GeekDesk Max. It’s been reliable, relatively quiet, has had no problems lifting everything I put on it, and it’s fairly stable even at standing height (although you can still feel a bit of wobble if you lean on it more than a bit). Although I thought it was silly at first, the four programmable height settings are a brilliant thing: I use one for my sitting height, one for my standing height, one as low as the desk will go (for a better window view when I’m not using it), and one at handwriting height while standing. 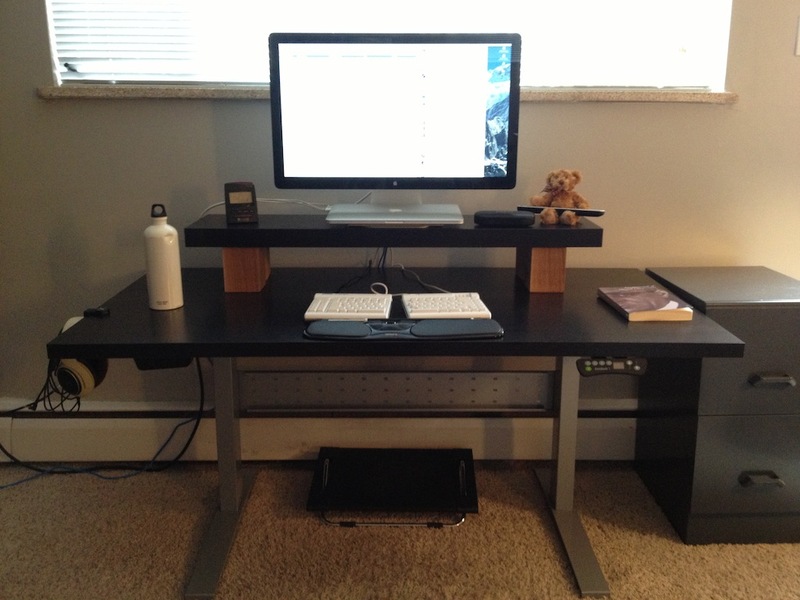 If you’re interested in an adjustable height desk, I would highly recommend GeekDesk to anybody. Most importantly, moving to an adjustable height desk helped a lot with the pain. The most beautiful thing about it, is that I was able to get my mouse and keyboard (along with the rest of the desktop) at the right height all the time, which immediately cut down on a lot of the pain I was feeling. I also find myself doing most of my actual work standing up, sitting down only to take a break every so often or at the end of a long day. It’s odd, but when I stand, I find I’m less likely to get into a “holding pattern”, surfing the same few websites over and over, and I’m more likely to actually get something done, and it’s infinitely easier to break off from the computer to go check the boiling water in the kitchen, etc. So, although your mileage may vary, the GeekDesk Max (and adjustable height desks in general) get my seal of approval. But even with the better desk, mousing and keyboarding still hurt. So, in the next part of my series on ergonomics), we’ll talk about mice, and how I managed to cut that pain out. Update (September 2017): Four years later, and across and inter-state move, the Geekdesk remains working. It’s having some occasional troubles raising or lowering (“Err #5”), but repeating the command works, and for the most part, it’s fine. In the future, I’ll probably end up with a more robust adjustable desk, with a bit more power, but it works!